In this episode, I focus on another small tweak that developers can add to their apps that will help make those apps look a lot more like native apps. I’m referring to the addition of the Tilt Effect to controls. By default, when you add controls to the canvas in Visual Studio or Expression Blend they do not get the tilt effect. This may seem like a small thing but as I’ve mentioned before the experience is something that users will notice and their ratings and as a result your rankings will be affected by that. The thing is, that there is, in fact, a really easy way to add the tilt effect to your apps using the Silverlight for Windows Phone Toolkit . You can grab the source code for that from Codeplex or, even easier, you can just pull it in to your project and reference it using Nuget. Adding the Tilt Effect is as simple as adding the namespace for the toolkit and then adding the effect to either the individual controls or to the entire page. In most cases it shouldn’t take you more than a few seconds on each of the pages in your project so there’s really no reason for you not to take advantage of this. 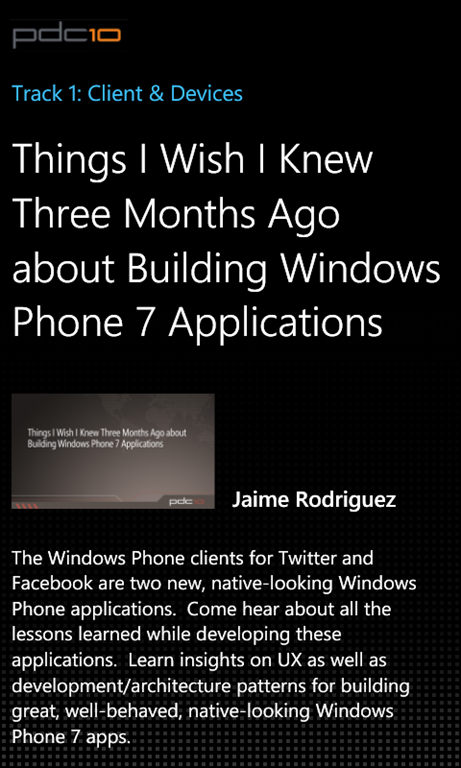 Vertigo Software just released their PDC10 Windows Phone 7 app. That’s going to make it a lot easier to follow along this year. If you have a WP7 device go download it now. This year we’ll be broadcasting pretty much every minute of the PDC. As part of building out the infrastructure and in an effort to extend that even farther out, we worked with Vertigo to ensure that both attendees and remote participants had on-the-go access to both live and on-demand viewing of the PDC event. 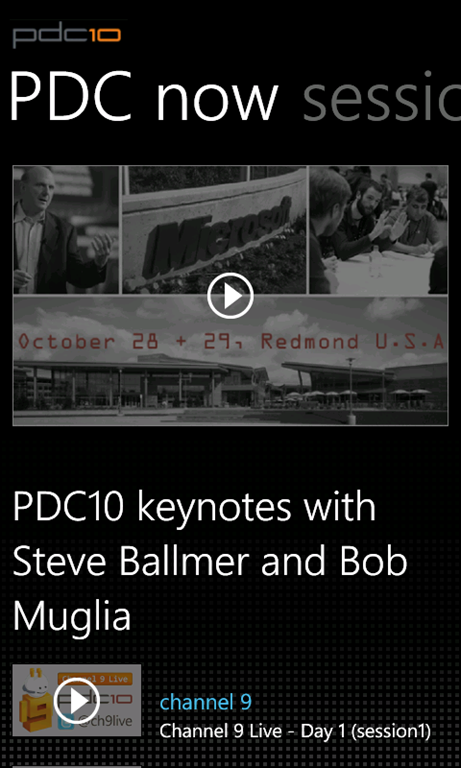 So for folks that can’t make it to Redmond the keynote will be available “live” on the device. Pre-recorded session content will be available once the conference starts. All other sessions will be available on-demand soon after the session is over (we’re shooting for within 24 hours). Content is delivered using Microsoft’s Smooth Streaming media format, specially formatted for Windows Phone. The content will contain multiple camera angles (speaker and presentation) and the PDC10 player allows the user to switch between these two views. Girish and I dropped in to the new Channel 9 Studio (formerly Monaco) to record a few Channel 9 episodes around some demo code we’ve been working on for a few months. In this series we’ll focus on self-service and specifically on building self-service sites that use Dynamics CRM on the back-end to enable customers, employees, citizens, etc. to get the information or perform the tasks they want without having to interact with a representative. We’ve talked previously about using Dynamics CRM as a platform to build general purpose line-of-business applications. Typically these are for users that are behind the firewall. When we’re talking about self-service we mean the wide range of users that are out on the internet that need access to that same information in the CRM data store. In this episode we walk through the demo in some detail. The Wide World Importers Conference site we use here is the main site for a fictitious conference. The self-service part of this is entirely hosted on Windows Azure. As we walk through the registration process the information is retrieved and stored directly in Dynamics CRM Online. Naturally, as we’ve said in the past, Dynamics CRM is great at managing both contact and transactional information. We also look at how, by using 3rd party web services, we can compose new capabilities into our system. In this case we show how to integrate an internet flight booking service into the attendee registration process and then store that complex flight booking information in the Dynamics CRM data store. Finally we show how to use Silverlight to build a compelling user experience for a self-service portal. This one is pretty slick. Dynamics CRM was customized here for the requirements of a conference organizer. In our case we used Dynamics CRM Online but it could easily have been CRM in an on-premises deployment (or hosted by any of the hundreds of Microsoft hosting partners) as long as CRM is set up in an internet facing deployment mode (IFD). The self-service site is running on Windows Azure so we walked through the Windows Azure Portal for the site to show how Azure helps us to deploy, configure and manage the site. The interesting part comes when we talk about how to scale up or down a site to handle large or small numbers of end-users (depending on the need of the application). Here Girish and I got into a discussion of running a site like this from the perspective of capital expenditures (capex) versus operating expenditures (opex). There are many scenarios like the conference one where the site will go through peak periods of high demand but then drop back down to very low demand. In those cases buying the equipment to handle the peaks means you have a lot of expensive equipment running idle during the low periods. Azure solves that problem by giving the power you need when you need it for as long as you need it. Unlimited scale for rent, I guess you could say. We’ll dive into each of the various pieces of the demo over the next few days so come back and have a look. Be sure to leave us your feedback below. This past week we presented the content we developed for the Business Action World Tour virtually via Live Meeting. We had hundreds of people register and join us for these events. The number one question people had was about getting access to the recordings for these events. I now have all the recordings and will publish these along with the Questions and Answers we fielded along with the calls. On Day 2 (Monday, April 28) we talked mostly about Windows Presentation Foundation and Silverlight and how you can take advantage of them to build compelling experiences for Dynamics CRM. We also showed a couple of groovy Dynamics CRM-specific demos that drove the point home. I’ve provided the link to what I think is the best quality recording but have included an edited Q&A log combining questions from all 3 events. We presented each session 3 times a day (2:00AM, 9:00AM and 6:00PM Pacific time). Thanks to Trond Brande and Almut Tadsen for handling the 2:00AM calls. Girish and I would have been pretty sleepy by the end of the week if they hadn’t done such a great job. I would recommend watching the High-Fidelity Recording available here. Update: I’ve also posted the PowerPoint decks for all the sessions on my SkyDrive. Question: Which Vector Graphics is supported (.eps, .AI etc) ?? Question: This TimeManager app is available for download? Is it production or only for demo purposes? Question: How is the connection between crm and Silverlight solved? via 2 web services? Question: What version of CRM is this? Question: Is this integration between CRM and Project? Question: Is the dashboard available for download? Question: But do we have any guidelines or documentation on the same? Question: For the project dashboard demo, that u just demonstrated,did u also use SSRS? Question: Is Silverlight integration possible for CRM Online or limited to CRM on-premise deployment? 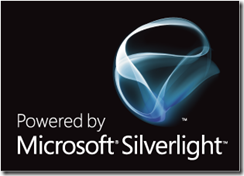 Answer: Silverlight may be used in CRM Online. You would use an iframe to insert the Silverlight control. You would have to host the Silverlight control on another server. Question: “Time and Expense” and “Projects” is an adaptation with development to manage projects? Is this available to download or get information about this. Question: Is this Dashboard was developed using the CRM SDK? Web Service means R u passing this info (Project/TimeSheets) from CRM to server which posts back with dashboard page? Where the web service is hosted? Answer: The web service is hosted in the CRM Server. Answer: Absolutely. WPF takes full advantage of whatever graphics hardware you have available. It will scale up or down depending on what is available. This is one of the main differentiators from Silverlight. Since Silverlight is a web app and by definition cross platform it cannot take advantage of local hardware. Question: Will the code also be available for review? This demonstration for the time sheet is very interesting but I haven’t used WPF or Silverlight so having the code would be great! Question: What are the options for distributing WPF applications to end-users of CRM? Question: Can you suggest resources for charts in WPF? Can you compare the capabilities of building charts in WPF, Reporting Services, and Excel? Question: What does RIA Platform stand for? Question: Can we get our hands on the demos used? Question: I posted a question but didn’t get response – my question was about the CRM customisation of time & expenses and project. maybe i didn’t confirm correctly. Question: Would we expect to see these technologies in future releases of Dynamics CRM? Question: Code Gallery project for Customizations? We’ve had some great success with the Business Action World Tour events worldwide. We’re now reprising that content virtually for those ISVs and developers who could not attend a physical event. Be sure to register via the links at the bottom of the post. Feel free to invite others… you know wake the kids, call the neighbors, etc. We know that differentiating your line-of-business applications from those of your competitors has never been more important. If you’ve considered using Dynamics CRM as a line-of-business platform, Silverlight or WPF to build compelling experiences, Office or SharePoint to build on the familiar skills of your end-users or Partner-Hosting or Azure Services to extend you application to the cloud, well then this is the event for you. We’re hosting a series of 4 online events (across multiple time zones) that will help you understand how we can help you do that as a valued Microsoft Partner. Because of the anticipated high-demand, we encourage you to register immediately to ensure your attendance at this valuable event. We’ve provided an overview below and the upcoming event dates and registration links at the bottom of this message. Be sure to register for all 4 online events. Microsoft Dynamics CRM provides the platform for getting your line-of-business applications to market fast. Clearly applicable in CRM-type scenarios, Microsoft Dynamics CRM also supports a wide range of business applications with the essentials required for building, delivering and maintaining them in multi-tenant Software+Services environments. This event will demonstrate the power of Dynamics CRM as a platform for developing line of business applications. It will also cover how solutions built on the Dynamics CRM platform benefit from other Microsoft technologies to provide compelling experiences, build on familiar skills and give your customers the power of choice. Increase user productivity and accuracy by providing an attractive, easy to use application user interfaces on either the desktop or the web using one set of tools and knowledge. With Windows Presentation Foundation (WPF) you’ll build the next-generation of Windows user experiences with deep support of data visualization, complex text content, rich media, dynamic interactive experiences, and branded or custom look and feel. With Silverlight you increase repeat visits and brand loyalty while dramatically reducing customer support costs through compelling, intuitive, high performance self-service web sites. Increase the productivity of the users of your applications by providing a seamless and integrated end to end experience that empowers them to collaborate and get work done in familiar ways. Pull line-of-business processing directly into the Microsoft Office applications your users use day-in day-out. Unified communications across the Dynamics CRM and Office line of products, such as instant messaging, document sharing, and user presence, further promote and simplify ad hoc processes and keep people in the center of the workflow – where they belong. Whether you are deploying behind the firewall or internet-facing applications, build and deploy those applications quickly and easily by capitalizing on the same personnel, development tools investments, and knowledge that already power your organization. When you build on the Dynamics CRM platform you’ll be prepared to deploy your line-of-business applications on-premises, in partner-hosted facilities or in Microsoft own Dynamics CRM Online data centers. When you build the internet-facing self-service applications that integrate with your line-of-business solution, the Azure Services Platform helps reduce IT-related costs, freeing up time and capital to focus on your core business. Be sure to register for all 4 events below. Note: You are free to register for any time zone you choose. The content is the same for all time zones. Note that you can only register for events in the future. We recently kicked off a worldwide tour events to help ISVs understand the potential of Dynamics CRM as a Line-of-Business Application platform. We know that differentiating your line-of-business applications from those of your competitors has never been more important. If you’ve considered using Dynamics CRM as a line-of-business platform, Silverlight or WPF to build compelling experiences, Office or SharePoint to build on the familiar skills of your end-users or Partner-Hosting or Azure Services to extend you application to the cloud, well then this is the event for you. We’re hosting a seminar near you that will help you understand how we can help you do that as a valued Microsoft Partner. Because of the anticipated high-demand, we encourage you to register immediately so you can ensure your attendance at this valuable event. To register, contact your your local Microsoft ISV Evangelist or Partner Account Manager. I’ve provided an overview below and the upcoming event dates at the bottom of this message. This is a half-day overview event which will demonstrate the power of Dynamics CRM as a platform for developing line of business applications. It will also cover how solutions built on the Dynamics CRM platform benefit from other Microsoft technologies to provide compelling experiences, build on familiar skills and give your customers the power of choice. I spent most of last week in hot and humid Houston at the annual Microsoft Worldwide Partner Conference. I did get to a few sessions but mostly I hung out with ISV partners in 1:1 meetings or in the exhibit area. There were tons of CRM ISVs showing interesting solutions. One that caught my eye was SalesCentric. Their solution is a simple but important one. Many sales cycles are very complex and long, involving interactions with many people within an organization. SalesCentric takes the list of contacts in the CRM system and makes the the relationships among them easier to visualize and discover. I was most interested in how they had transformed their ActiveX product into a brand new Silverlight solution. I thought others might find this interesting as Silverlight starts to get some attention. I also get excited at the possibility of seeing this as a mechanism for bringing information from other systems such ERP systems for example or maybe even social networks for the ultimate selling tool. I’m nothing if not persistent! :) You may have noticed that the Office Developers Conference was in February and I only just managed to post the video of my demo today. There’s a story there. There are a lot of reasons for it taking that long. Mostly it just took a couple of months to track down the video and it get cleared to post. But when I got it in April it occurred to me that I had no idea how I was going to show the demo video on my blog. It wasn’t really technical enough to be putting up on Channel 9. And putting it on MSN Soapbox didn’t seem right to me as the quality of the screen shots would have been lost. This was the right time to figure out how to take advantage of Silverlight Streaming. It would give me the opportunity to post the video in pretty close to original quality and size. It would also give me a chance to play with some of the Expression line of design tools. Well long story short I ran into a few problems with a beta version of Expression Encoder. I hit a bug where videos encoded with Expression Encoder could not get uploaded to Silverlight Streaming. Tim Heuer finally came to rescue yesterday and that pushed me to try again. With the help of Jaime (a Silverlight demigod and all round mensch) I was able to get the darn thing uploaded. So anyway in case you were wondering and also so that when I hit the issue again I know where to look to fix it that’s why it took me 4 months to make my ODC keynote demo video available. Silverlight Streaming frickin’ rocks as a streaming video platform. If you have videos you want to get out there and Soapbox or that other site don’t do it for you, Silverlight Streaming is a fantastic alternative. In fact, even if you are happy with those other sites you owe it to yourself to try out Silverlight Streaming. You’ll love it. Sign up for a free 10GB account now. That’s right 10GB and it’s free! Expression Encoder frickin’ rocks as an encoding tool. I was able to get my video encoded the way I wanted with a cool animated video player template, chapter markers, and thumbnails all without having any clue about video production. A little more knowledge and I’d be dangerous. I also found that it’s great at encoding videos for filling up my Zune. BTW, a little known fact is that Silverlight Streaming supports WebDAV. 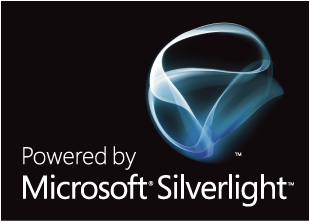 To get that to work all you have to do is map a network drive to https://silverlight.services.live.com/ using your Silverlight Streaming Account ID as the user name and your Account Key as the password. You’ll find the Account ID and Account Key on the Manage Account page when you’re logged in to Silverlight Streaming.